A soothing blend of chamomile, spearmint and lemongrass, Sleepytime is the most beloved of our herbal tea recipes. .“Sleepytime's comforting aroma and perfectly balanced flavor are achieved by blending soothing herbal ingredients from around the world – including floral Egyptian chamomile, cool spearmint from the Pacific Northwest, and lively Guatemalan lemongrass. This global synergy is only fitting, since all over the world, generations of tea lovers have wound down their day with Sleepytime." Joanne "Great way to fall asleep"
This has really helped me get rest after a long time. I am glad I finally found something to make me feel so much better. 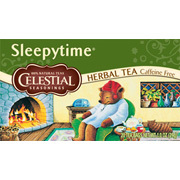 Sleepytime Herb Tea - 40 bags is shipped in a discrete, unmarked package. Orders are processed immediately and usually takes about 3 to 5 working days to be received. We do ask that you try it for 2 to 3 weeks to feel the full effects. Any information received is used only for order processing and shipping purposes. Your information, such as e-mail address, will never be disclosed to a third party.